Finished in Cherry Bordeaux on select hardwoods and veneers. 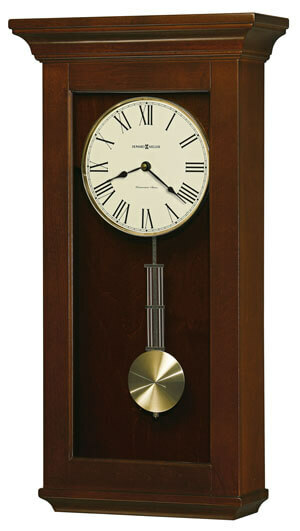 This wall clock features a flat top pediment. Circular brushed brass-finished pendulum bob with a brass-finished grid. Lamb's wool dial with black Roman numerals, a brass-finished bezel, black spade hour and minute hands, and plain glass. Quartz, battery-operated, single-chime movement plays Westminster chime and strikes on the hour. Volume control and automatic nighttime chime shut-off. You will save $90.60 (30 %) on this Howard Miller Continental 625-468.